If you’re in the market for a work truck that can handle any task, the 2019 Ram 2500 is a great choice. It combines comfort with power and performance. Let’s discuss some of the 2500’s exciting features. When it comes to delivering a powerful ride, the 2019 Ram 2500 can’t be beaten. All trim levels come equipped with a 410-horsepower, 6.4-liter V-8 engine. When equipped with the optional diesel engine, the 2500 can tow up 17,930 pounds and handle a maximum payload of 4,050 pounds. With the gooseneck prep package, maximum tow capacity is increased to 18,850 pounds. The Power Wagon trim comes equipped with a 12,000-pound winch for even more power. No matter the job, the 2500 is perfect for hauling and towing all of your necessary equipment. In any driving condition, you’re in for a smooth drive when you take the wheel of the 2019 Ram 2500. The TorqueFlite eight-speed automatic transmission, available in the V-8 models, automatically optimizes shift changes for maximum efficiency, performance, and drivability. A six-speed automatic transmission comes standard in the diesel models. Frame-mounted vibration dampers prevent unwanted vibrations from bleeding into the 2500’s cabin. Active grille shutters and a lower air dam have been added to the exterior to improve the truck’s aerodynamics. The interior of the 2019 Ram 2500 not only provides a comfortable driving experience with lots of legroom and luxurious leather seating, but it also makes a great workspace. The 2500 features a bin for hanging file folders, a center console large enough to hold your laptop, and USB high-speed charging ports. Even more storage space is provided by the available RamBox cargo management system. The active noise cancellation system along with acoustic glass provides peace and quiet, even on the noisiest of job sites. With the 12-inch UConnect touch screen, you’ll be able to access all of your favorite apps, navigation tools, favorite podcasts, and anything else you need to manage your day. The 2019 Ram 2500 was designed with your safety in mind, providing all the features you need to feel confident enough to get the job done. Standard safety features include brake assist, traction control, and a total of six air bags. The available forward collision warning with active braking warns you in the event of an impending collision and applies the brakes as needed, even when you’re towing a trailer. The 360-degree surround view camera gives you a clear view of the vehicle’s surroundings, making it easier to pull into and back out of tight spaces. Towing is safer with the 2500’s trailer brake controller and optional trailer tire pressure monitoring system. The optional cargo camera lets you know what’s going on with any gear you have stored in the bed of the truck and also gives you a view from the trailer hitch. 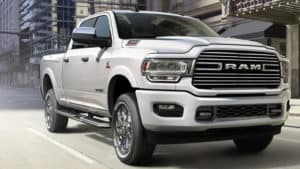 These are just some of the features that make the 2019 Ram 2500 a great work truck. Consider taking a test drive to see for yourself.